Really hope someone can help me with this. I've looked through the other posts and can't find one similar enough to mine to answer. I've got an old gas furnace + AC and i'm installing a Sensi Wifi theromostat. There's only 4 wires and I cannot figure out how to do the G wire to C conversion because my furnace has no terminals. It looks like someone added a 24v transformer at some point and i think i can just tap into that for my new theromostat but i don't want to connect it incorrectly and damage something. I can easily run a new thermostat wire that will have 5 wires, but i'm unsure where to attached that new C wire. Any help would be really appreciated. Since you have air conditioning, we can pull a little trick here. 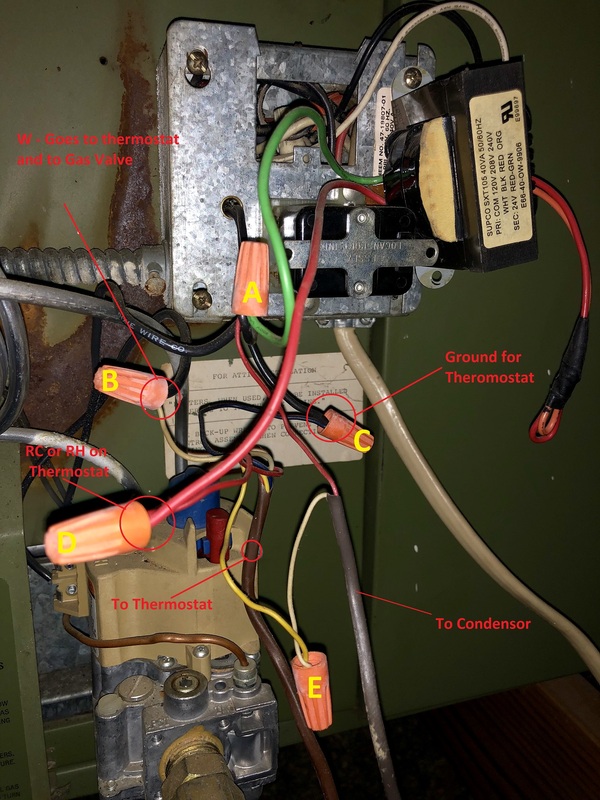 We start with the yellow Y wire from the thermostat, noting that it is connected to one wire going off to the outdoor unit (condenser) via wirenut E. Since we know that the thermostat is putting 24VAC from R onto Y to call for compressor, we know that the other wire coming back from the outdoor unit must be a C wire to complete the circuit. Following it, we come to wirenut A, which just so happens to be quite a convenient place to make the thermostat C-wire connection at. How do I connect a WiFi thermostat to my furnace's primary control?